Information about bears in Lincoln County and the Kootenai National Forest. Black and grizzly bears are found in the mountains of northwest Montana, with black bears being much more common. Although an encounter with a Grizzly bear is possible, especially in remote wilderness areas, it is unlikely. Black bears are not as aggressive as Grizzly bears and most often tend to want to avoid humans. Their range is extensive including most of Canada and the Rocky Mountain states to Mexico, as well as other US states. They are seldom seen above 7,000 feet elevation. You may encounter black bears in trees. Unlike the grizzly, who does not climb trees except as a cub, the black bear is a very proficient climber. They will often sleep in the crotch of branches. The black bear is omnivorous which means it eats vegetation, berries, insects, fish, and meat from small and big animals. During the fall, they eat more than usual to gain body fat to sustain them through their winter "hibernation", which is not a true hibernation, but rather a deep sleep from which they can awaken quickly. When food is abundant, they will eat up to 45 lbs. a day and put on 5 lbs. per day in preparation for winter. During winter "hibernation", the bear may only eat once a week, or if it is very cold he will not eat for a month. While "hibernating", the black bear does not urinate or defecate. The black bear's name is deceptive. It is a species name and does not refer to their color as they can range from pure black to cinnamon to blonde. Black bears in the East are nearly black, while those in the West are black to cinnamon with a white blaze on their chest. The black bears in Alaska can have a blue or white color phase to blend with their snowy surroundings. Black bears reach maturity in about 3 years and can live up to 25 years in the wild. 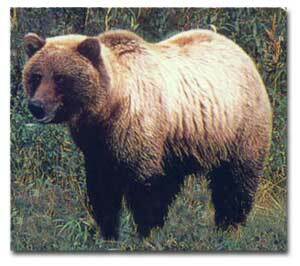 Grizzlies are found in Canada, Alaska, and reserves in Montana, Idaho, Wyoming, and Washington. The largest United States population is in Yellowstone National Park. The grizzly is the most aggressive of all the bears. The grizzly has no enemies or predators. The grizzly rarely fights and when he does, it usually is the victor. Grizzlies forage for food in the spring and summer. They are omnivorous, which means that they eat both vegetable and animal matter. Its diet includes fruits, berries, nuts, roots, fish, rodents, and occasionally other animals. It can spot food up to 18 miles away with its keen sense of smell. Grizzlies hibernate in much of the same way as other bears. During the summer and fall, they stock up body fat for the long winter sleep. They usually dig their dens in the fall. They are not "totally" asleep during the winter. If it is a nice, warm day, they will come to the ground in search of food. Grizzlies can grow to 7 feet in height and weigh from 325 to 850 lbs. They reach maturity in 3-4 years and live as long as 30+ years in the wild. In captivity, grizzly bears have lived to almost 50 years of age. Grizzly bears are listed as " Threatened" under the Endangered Species Act of 1973 and are protected. Killing a grizzly bear in the lower 48 states is both a federal and state offense that can bring criminal and civil penalties of up to $50,000 and a year in jail. The Forest Service and Montana Fish & Wildlife Service have information which describes the physical differences between Grizzly and Black Bears that can help you know which type of bear you may be dealing with. Before hiking or backpacking in remote areas, be sure to stop in at local Forest Service offices to find out current conditions and any advisories or precautions about bear activity in the area you wish to visit. Learn to tell the difference between a black bear and a grizzly bear. Choose a campsite free of fresh bear signs. Store food very high in a tree (at least 10-15 feet high and 4 feet from the tree trunk). Pick a tree away from your camp. Under no circumstances should you store food in your tent or leave food in it. If you are above tree line, store attractants in doubled plastic bags, as high and as far from your camp as practical. Remember that things like toothpaste, cosmetics, deodorant, canned foods & beverages, pet food, horse pellets and animal carcasses (such as fish remains) can also attract bears. Cook meals away from your sleeping area. Do not sleep in or near the clothes you have handled food in. Always keep a clean camp and wash all utensils after eating. Either burn garbage or hang it with other bear attractants. Do not bury garbage! As you hike in forested areas, talk with your partner(s) or make some sort of noise. Bears do not like surprises! Do not try to feed or approach bears, ever! Avoid coming between a mother bear and her cubs. Keep pets from harassing bears. Dogs and bears do not mix! Report any bear encounters to the Game & Fish Department or US Forest Service, no matter how insignificant. A fed bear is a dead bear! When people do not store their food and garbage properly, a bear will quickly learn that this is an easy meal. Once a bear has become habituated to human food, it loses it's fear of humans. Bears that seek food at campsites may be removed from the area or destroyed. All page content copyright 2004. All rights reserved. Photos by LibbyMT.com unless otherwise credited.